This leave-on coconut bio-cellulose mask is delivers a powerful serum complex to leave skin luminous, brightened and camera-ready. The Starskin After Party Bio-Cellulose Brightening Face Mask intensely energizes skin for a visibly brighter, radiant looking complexion. It is formulated with naturally fermented, vitamin-rich coconut juice and it revives and conditions the skin without any irritation. Energizes and recharges visibly dull, tired and lackluster skin. The translucent, cooling sheet contours closely to the face to deliver a powerful complex of Vitamin C and a proprietary herbal medley, all working together to reduce the aging signs of visible dark spots and uneven skin tone. Every brightening face mask is soaked in a full bottle of skin revitalizing organic skincare serum which transforms skin that has been up all night into starlet worthy luminous skin in just 20 minutes. Minimizes dark spots and evens skin tone. This is organic and innovative skincare at its finest. Easy to use, next generation bio-cellulose delivers results in 20 minutes. Cooling second skin brightening face mask. Do you want bright skin immediately? Then this is the way to do it. I know you may not believe it, but my skin brightened up immediately when I wore this. I had been having hyperpigmentation problems for a while now and really wanted something that helped out with that. This was it. This lightens up skin and dark spots/freckles in 20-30 minutes. It is a minor miracle. After I saw the results I was about to say, "Hallelujah!" 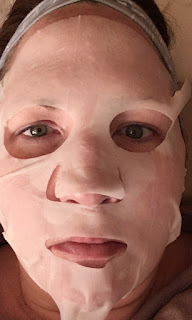 One of the other masks I tried was the Close-Up Firming Bio-Cellulose Second Skin Face Mask. This mask is also made from a coconut Bio-Cellulose, and is a Second Skin Firming face mask that delivers a powerful serum complex to leave skin looking youthfully lifted, smoothed and close-up ready. This mask firms, lifts and sculpts skin for a supple, youthful appearance. The premium Bio-Cellulose is formulated with a naturally fermented, vitamin-rich coconut juice, and firms and nourishes the skin without irritation. This translucent sheet mask contours closely to the face to deliver a powerful complex of Glacier extract and Tripeptide-1, which improves the appearance of saggy, drawn skin. Each and every face mask is soaked in 1 oz./30mL of serum that leaves skin looking flawlessly beautiful and ready for even the most high definition close-up. Ace the A-List way to restore firmer and smoother skin in just 20 minutes. This mask is easy to use, is a next generation bio-cellulose that delivers results in 20-30 minutes and is a cooling second skin firming face mask. If your skin is pulling more these days, feels thinner and is sagging some, then this is the mask for you. Elasticity and collagen both wear away as we age and only collagen can be produced again. Once the elastin is gone, it is gone. That is why you stay out of the sun, as it is one of the things that promotes free radicals, which basically knocks away the elastin. So, use masks like this to firm up the skin, then sunscreen and keep it firm for as long as possible. THE GOLD MASK Luxury Bio-Cellulose Second Skin Revitalizing Face Mask instantly plumps, replenishes and pampers for a rejuvenated looking skin. Lavish your skin in pure luxury with this mask, a decadent treat for dull, dry or lackluster complexions. Formulated from naturally fermented coconut water, the premiu, Bio-Cellulose sheet mask is infused with a rich creamy serum made from the finest ingredients. A base of very deeply nourishing Evening Primrose extract (68%) leaves skin dramatically softer while pure colloidal gold diminishes the appearance of fine lines, wrinkles and sun damage. 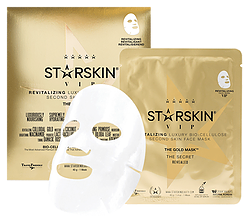 The mask's miraculous skin-rejuvenating effects are enhanced by collagen-boosting Ginkgo Biloba leaf extract, wrinkle smoothing Adenosine and brightening Kudzu root extract. When using the mask, in just 15-20 minutes The Gold Mask will leave your skin replenished, rehydrated and visibly plumper with and opulent, star like glow. This mask is meant for those who have very dry, dehydrated and mature skins. It is for those who need a really good moisturizing pick me up. The mask is so rich and so creamy that it left my skin feeling so soft and supple. I didn't mind it at all. My skin is usually dry, except during the summer when it becomes normal. I think anyone with the skins mentioned above would adore this mask. Those with combination, oily and acneic skins should avoid it. STARSKIN is sold in various outlets throughout the country: Barney's New York, www.cloud10beauty.com, www.beautymart.com, www.beautybay.com, Harvey Nichols, Anthropologie and Planet Parfum. The website says SEPHORA sells STARSKIN, but I checked and could not find them on the website. Maybe they only have them in store. Like STARSKIN on Facebook: https://www.facebook.com/starskinbeauty and Follow STARSKIN on Instagram: http://www.instagram.com/starskinbeauty.